Special thanks to the California Coastal Commission for choosing us as a recipient for the WHALE TAIL® Grants Program. You can support the WHALE TAIL® Grants Program by purchasing a WHALE TAIL® License Plate or by donating to the Protect Our Coast and Oceans Fund on the California state tax form. Looking for sporty goods? Head over to Sports Basement and become a Basementeer—10% of profits will be donated to the charity you choose. Thank you Sports Basement and the Basementeers who pick us as their charity of choice! The Marine Mammal Center is set up to get donations through Amazon Smile! When you buy things on Amazon, you can choose the Center as your charity and 0.5% of the purchase price will be donated to help our pinniped patients! Check it out next time you’re shopping online! Clean out your closet to save our seals! Donate your gently used clothing, accessories, housewares, furniture, and more to Community Thrift in San Francisco. When you donate your items, designate The Marine Mammal Center as your charity of choice and see what a difference you can make! Find out about our pinniped patients and follow their fascinating stories. 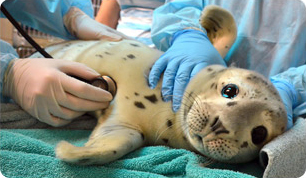 Sign up for email updates from The Marine Mammal Center.